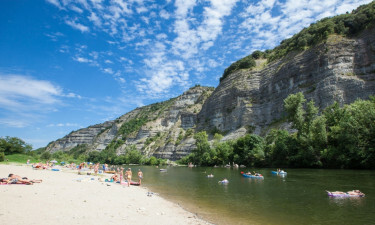 Situated along the Ardeche River in the Ardeche region of France, La Grand’Terre is the perfect campsite for people who enjoy luxury camping. Whether you want to take advantage of the wide range of activities and facilities that are provided right on the site, have a very comfortable base to use while exploring the area or simply want to unwind in comfort and style, this is the perfect place to stay. 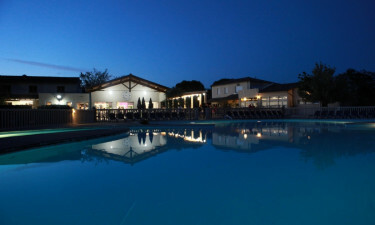 What makes a camping holiday at La Grand’Terre so special? The gently flowing waters of the Ardeche River are cool and clear, and the ideal spot to take a dip during the sultry summer months. 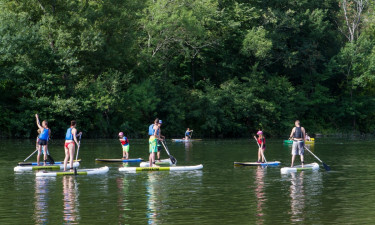 A large number of aquatic activities can also be enjoyed here, such as boating and fishing, while the river is lined by a narrow stretch of pristine golden sand where guests can soak up the sun for an hour or two. And perhaps best of all, guests will find that the river is located just a short stroll from their mobile home. People who have a strong sense of adventure will find plenty of activities that are sure to get their adrenaline pumping, both on the luxury camping site and in the surrounding area. Canyoning offers people who have a head for heights the opportunity to experience the intense natural beauty of this part of the world in a whole new way, while guests can also hire a kayak to gently paddle along the river. Equipment hire and experienced guides are available and lessons are also provided on request. People who stay at this leading LUX-camp can be sure that they will never have to go far in search of entertainment. The Mini Club is available for children aged from 4 to 12 years old and is run by professional staff who organise a wide range of different types of activities, while the whole family can have fun together by singing their hearts out during the karaoke evenings, swimming in the large outdoor pool or playing table tennis. Guests can retire to the terrace to dine on delicious French cuisine that highlights some of the best fresh produce from this region of France. The restaurant is open for breakfast, lunch and dinner, and the talented and very creative chefs work hard to whip up simple, yet very tasty dishes for the whole family to enjoy. The onsite supermarket is a good place to pick up last-minute items and there are plenty of bargains to be found there. Those who prefer to indulge in a more engaging shopping experience can also make their way to the village of Ruoms, which is located just 2 miles away and boasts a good selection of shops and other amenities.